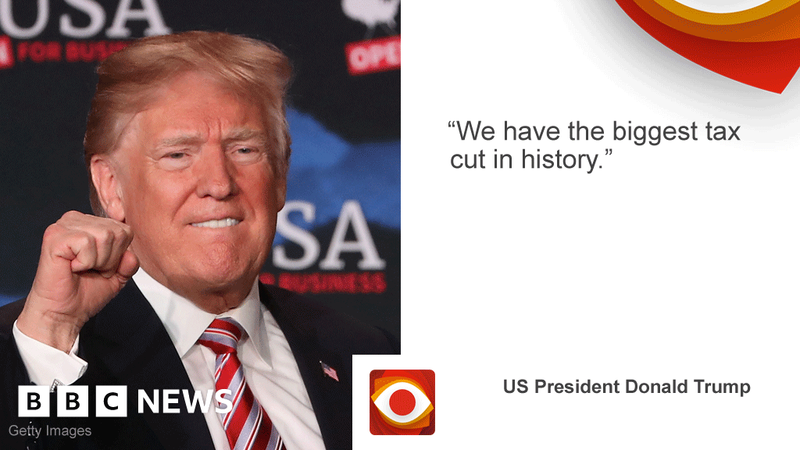 US tax cuts: Are they the biggest in American history? Claim: President Donald Trump has said that the recently passed Republican tax reform legislation is the “biggest tax cut in US history”. Verdict: It is not the biggest tax cut in US history, measured as either a percentage of US GDP or in absolute terms. It is however, the biggest corporate tax cut in US history. It’s tax day in America – something most Americans dread. But this year, the filing of both personal and corporate taxes has become even more complicated due to the recently passed tax reform bill in the United States. But while most Americans are filing for 2017 and so won’t feel the biggest impact until next year – is the claim true? Various think tanks and websites have attempted to calculate the total reduction in taxes for both US citizens and corporations this year. The Committee for a Responsible Budget crunched the numbers and said President Trump’s tax cuts would be the eighth-largest in US history, measured as a percentage of GDP (to do so, they used a study from the US Treasury that looked at the impact of tax reform bills passed in the US between 1940 and 2012). If you adjust the analysis for rising prices, President Trump’s tax cuts rank fourth overall. By either measurement, they’re certainly not the biggest in American history. Interestingly, President Trump might be half right: it seems that corporations will have plenty to cheer this tax day (that is, if anyone is ever happy after reading through the US tax code). According to an analysis from the Congressional Budget Office looking at corporate tax rates around the globe in 2012, this is essentially true. Most analyses suggest that in absolute terms, this year’s reduction of the US corporate tax rate from 35% to 21% is the biggest corporate tax cut in US history. It beats that corporate tax cut passed under former US President Ronald Reagan, which lowered the rate from 46% to 34%. So how much will corporations save? The key thing to remember here is that very few US corporations actually paid the headline federal corporate tax rate of 35%. Many US companies take advantage of various loopholes – like being able to deduct the interest they paid on loans – to lower their overall tax bill. The US Treasury has said that the effective corporate tax rate was 22% in 2016. This average ignores the very real differences in taxes paid by companies – which is dependent on the sector in which they operate. But a recent analysis from Bank of America Merrill Lynch found that the average US company listed on the S&P 500 index had a tax rate of just 19.3% last year. And the number is even smaller for US technology firms, which had an average tax rate of just 16.9%. Technology firms can often take advantage of the fact that much of the US tax code was written to tax traditional manufacturing companies with physical assets. This allows them to often shift their profits to areas with lower taxes – like countries with lower corporate tax rates. US corporations currently have an estimated $ 1.2 trillion (£838bn) in earnings that are kept overseas – $ 710bn (£496bn) of which belongs just to companies in the tech sector. None of those profits is taxed at the US corporate tax rate until those companies decide to “repatriate” those profits and bring them back into the United States.